Due to the language barrier between humans and their pets, it is often difficult for many owners to know when something is wrong with their beloved pet. When your pet starts acting strangely or suffers an injury, it can be challenging to decide if you should seek care immediately by an emergency veterinarian or wait until your family veterinarian is open. The emergency veterinary team at Austin Veterinary Emergency and Specialty Center (AVES) wants to help you identify and be prepared for any emergency situation. If your pet is not breathing and you do not feel a heartbeat, call an emergency veterinarian immediately. They will guide you through performing CPR while a family member or friend drives you and your pet to the emergency room. If your pet displays any of these symptoms, it is very important that you take them in for evaluation immediately. Once you have decided that you are in an emergency situation with your pet, it is important that you try to get your pet as stable as possible before transporting them to the emergency hospital. Here are a few quick first aid treatments you should attempt before loading your pet up in the car. Use caution when handling scared or injured animals to avoid getting bit or scratched. For external bleeding, apply pressure to the wound and try to keep it elevated. If your pet is choking, try to remove the object from his or her throat with your fingers. If that doesn’t work, you can perform a modified version of the Heimlich maneuver by giving a sharp rap to his or her chest. If your pet is unconscious and is not breathing, assisted breathing can be performed. To perform assisted breathing, extend your pet’s neck and hold his/her mouth closed tightly with your hands. Create a tight seal with your mouth over their nose and blow into their nostrils once every 3-6 seconds. You should see your pet’s chest wall rise with each assisted breath. If your pet is unconscious and you do not feel a heartbeat, CPR should be started immediately. You should be able to feel your pet’s heartbeat by placing your hand on their chest (just behind their elbow). If you do not feel a heartbeat, begin chest compressions. Push firmly on their chest in a rhythmic fashion. Provide 30 chest compressions followed by two assisted breaths (see above). Continue CPR while someone is driving you to a veterinary hospital or until your pet regains consciousness. In addition to these first aid treatments, you should also know what to do if you believe your pet has eaten something poisonous. First, you should call a veterinarian. If it is during normal business hours, you can contact your family veterinarian. Otherwise, you can call an emergency veterinarian to tell them what your dog has ingested. Based on the potential toxin eaten, you may be directed to call the ASPCA Animal Poison Control Center’s hotline at 888-426-4435 to speak to a toxicologist who can make recommendations about care. In some cases, you may need to induce vomiting. Before you are ever in an emergency situation, you should be prepared for one. 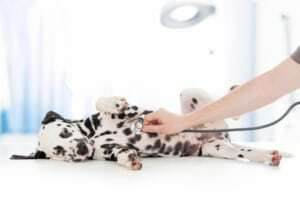 To get started, you need to find an emergency veterinary hospital. You can either ask your family veterinarian for recommendations or do a little research on your own to find one. You should keep the phone number and address for this hospital on hand. In addition, you should keep your pet’s updated medical records together in a place that is easy to access in the event of a pet emergency. These documents should contain the name, address, and phone number for your family veterinarian as well. Keep first aid tips with the medical records to help you care for your pet until you can get to the hospital. It may be a good idea to keep the hospital information with these documents. In the best-case scenario, you would’ve been able to call either before you started driving to the emergency clinic or at least while you were on your way. If you can call ahead of time, it is easier for an AVES veterinarian to help you get your pet out of the car. Once you have arrived at the veterinary hospital, an AVES veterinarian technician will immediately evaluate your pet to determine whether they are stable. Patients evaluated through the emergency department are seen in order of their critical nature with the most critical pets being evaluated first. Much like at a human ER, the veterinarian will treat your pet as soon as possible. You will be asked to provide your pet’s medical history, so the veterinary team can better care for your pet. An emergency veterinarian will meet with you and provide you with treatment options for your pet including associated finances. In some cases, the team will want to keep your pet in the hospital for further treatment, and your pet will be admitted. At this point, you will receive regular updates on your pet’s status. When your pet has completed treatment at AVES, an emergency veterinarian will recommend that your pet is either transferred to one of AVES’ specialists, to your family veterinarian, or to your home. This decision will be left up to you, the emergency veterinarian, and your family veterinarian. If you live in the Austin, Texas, area and are in need of emergency veterinary care, AVES has a team of emergency doctors that will provide your pet with high-quality medical care. If you are having an emergency, call AVES at 512-343-AVES (2837) right away. AVES is open 24 hours a day, seven days a week, and 365 days a year. How Can You Help Your Pet Recover from Surgery or Trauma?